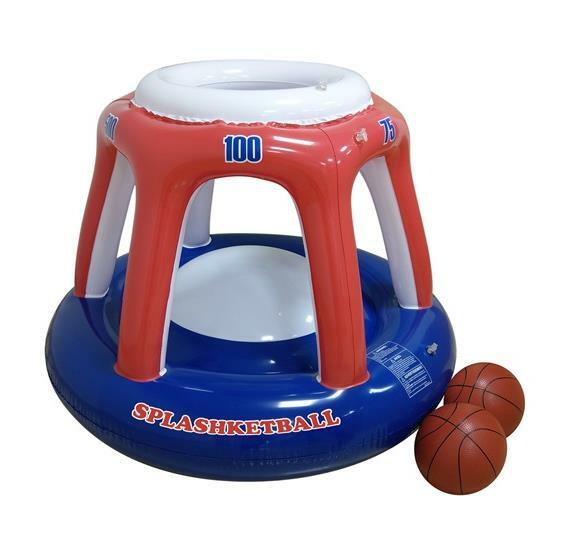 Your backyard pool parties will be ballin' with Splashketball! Points rack up quickly, so it's anyone's game. FULL-SIZE POOL HOOP - This full-size Splashketball game measures 45-inches by 36-inches. It fits easily in backyard pools while being large enough to make a nice-sized target. TWO INFLATABLE BASKETBALLS INCLUDED - This Splashketball set comes with two inflatable basketballs so multiple player can practice shots simultaneously. MULTI-PORT BALL RETURN - The floating hoop has 6 distinct ball returns for multiple players. You can play variety of different water sports - play in teams or have a free-for-all. STABLE HOOP STAYS AFLOAT - At almost two and a half feet tall and wide, the Splashketball basket is super stable in the pool. So, shoot as hard as you like and don’t worry about knocking over the goal!